We have no photograph of the house that became 16 Chapel Street in Thornbury other than a very poor quality extract from an aerial photograph of about 1956. The extract is shown here on the right. Despite the lack of clarity it is possible to make out what is now the United Reformed Church in the foreground. In this photograph the URC looks like a T shaped building with the row of windows facing us and the main body of the church at right angles to the foreground and facing Chapel Street. To the left of the URC and on the corner of Chapel Street and Rock street is 16 Chapel Street. In this photograph no 16 appears to be a substantial double fronted building. The long narrow building behind number 16 is another building. We assume that this is the garage or stable associated with it which was later used as an office for the Market. However we have no supporting evidence for this. We would be very grateful for a better photograph of these properties which were demolished in the 1960s as apart of a redevelopment scheme and in order to build new flats. We don’t know when this property was built or who built it. The house was on the corner of what is now Chapel Street (shown on this Tithe Map of 1840 below right as “Rotten Row”) and Rock Street. On the Tithe Map of 1840 it was given the number 117. In the Apportionment it was described as a house and garden then owned and occupied by John Gough. South Gloucestershire Council was kind enough to give us access to the deeds and documents it holds for many of the properties in Thornbury, including this one. From this we had found that it was built on a close of land called The Paddock, a close (of two acres) was acquired by Matthew Mills from William Taylor in 1811. Click here to read the history of The Paddock. John Gough. By 1840 we know that this property was allocated number 117 in the 1840 Tithe Map and that it was a house and garden owned and occupied by John Gough. The 1841 census shows that John Gough was a musical instrument maker then aged about 40. He was living with Ann Gough who was aged about 80 and a maid called Ann Wilson then aged about 45. John Gough appears to have been born in Thornbury. He may have been the son of John Gough a turner and his wife Ann (nee Mottley or Motley) who were married in Thornbury on 17th May 1795. It is possible that John’s father John Gough senior died in 1797 and was buried on 13th December when John junior was still a baby. We also have a record of a person called Ann Gough renting a property that became 4 Chapel Street from 1797 to about 1806 . There is an indenture dated 15th January 1840 that led to the setting up of Crossways Chapel and signed by a group of the leading members of the Independent Chapel in Thornbury including the Rev William Dove and members of the congregation such as Handel and Jesse Cossham. The name of John Gough is on this list and he was described as a musical instrument maker. It suggests that John Gough, like the Cossham family, was a leading member of the Independent Church. We can be sure that John Gough continued to live in Thornbury until at least his mother’s death. The Bristol Times and Mirror of 21st October 1843 announced the death of John’s mother Ann Gough aged 84 at her son’s residence in Thornbury on October 18th of that year. We have had great difficulty in tracing the marriage of John Gough. It seems most likely that he married Eliza Walker in St Paul’s in Bristol on 18th September 1845. The record of this is in the IGI and says that the bride’s father was William Walker. We know from the 1851 Census that Eliza was then 23 and born in Thornbury. There is a baptism of Eliza Walker in Thornbury on 20th April 1828 whose parents were William and Sarah Walker. Their abode at that time was shown to be Almondsbury near Thornbury and William was a thatcher. We believe that by 1841 Eliza had already left home and was working as a servant in Bristol. The 1851 census confirms that John Gough had moved to St Paul’s in Bristol to Cherry Alley where he was said to be aged 52. He was described as a pianoforte maker. His wife Eliza was aged 23 and she was also from Thornbury. Although Eliza was so young she must have died within the next few years. By the 1861 census John appears to have remarried. We have found several deaths registered of an Eliza Gough in Bristol in the early 1850s and one in Thornbury in 1855. We are unable to say which is most likely. The 1861 census shows John as a pianoforte tuner and aged 64. His second wife Sarah was aged 66 and born in Devon. Their address was Lewins Alley in St James in Bristol. John may have died in Bristol in 1890 aged 87. The Dursley Gazette in 1917 had an article about John Gough that said that the violins made by him were much sought after. The article says that John was born in Thornbury but that he went to work in Bristol where he produced violins until at least 1860. The biographical directory of British Violin Makers says that John Gough was mentioned in a booklet by Spencer Palmer and that there is a particularly fine violin made by him owned by a gentleman in Cardiff. There is a note in British Violin makers to the effect that John may have worked for Mark William Dearlove. We cannot comment on the accuracy of this. Mark William Dearlove (1803 -1880) was a musical instrument maker in Leeds in Yorkshire. Abbey House Museum in Leeds has a reconstruction of his shop. George Walker. The next owner we know about was George Walker who owned the property from at least 1876. George was a butcher who lived first at 9 St John Street and later in the High Street and St Mary Street. He owned several properties in Thornbury, including 16 Chapel Street. Click here to read about George Walker. The rate books of 1880, 1885 and 1887 show that Walter Baylis was a tenant of George Walker in this property. The rate book of 1890 shows that George Walker still owned 16 Chapel Street but no occupier is named. By 1894 the rate book describes it as a house and garden tenanted by Henry Holpin. On 24th June 1898 George sold the property to Thomas Exell for £292. Lilian Mary Exell the daughter of Thomas Exell married Reginald David Edwards a brewer’s surveyor on 4th April 1931 at Holy Trinity Church Walcot in Bath. On 17th March 1947, Lilian died aged 61. As she had died intestate her married sister Bertha Annie Winter was granted letters of administration of the estate. On 24th February 1948 Bertha sold the property to Leslie James and Lyndon Augustus Hawkins for £150. George Henry Dawes. On 25th March 1948 for £375 George bought number 16 Chapel Street and the coach house and stable belonging to the property from Leslie James Hawkins and Lyndon Augustus Hawkins. The house was occupied by Mrs Sims. The Coachhouse was used by Mr Dawes on market days, (at that time Thursdays) for his business. At that time of the purchase of the house George Dawes was said to be a corn merchant living in Tockington. 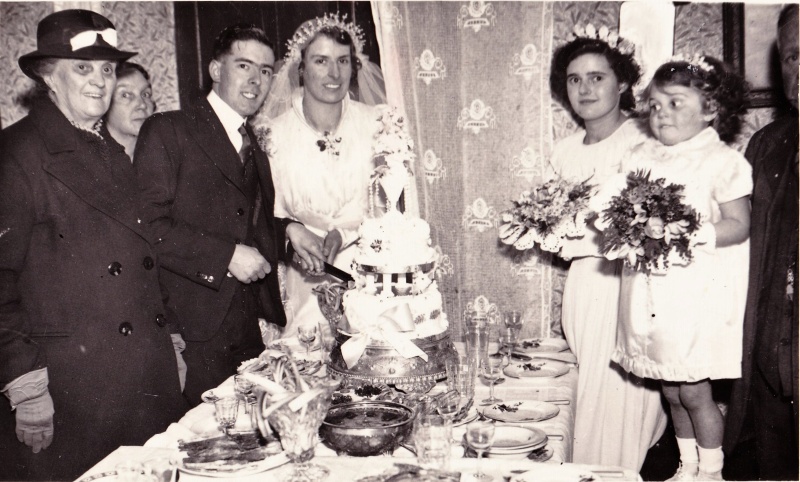 George had married Gladys M Shaul in 1930 in the Bristol District. They had two sons Nigel in 1933 and Peter in 1941. We have no trace of George in the electoral registers for this period and we assume that he did not live in Chapel Street. On 24th August 1954 George Henry Dawes sold the property to Beatrice Susannah Trayhurn. George Henry Dawes of Cromwell House, The Street Olveston died on July 25th 1960. Probate was granted to Gladys Marjorie Dawes his widow. In 1954 Beatrice bought 16 Chapel Street and she and Thomas moved there until Beatrice sold the property to the Council for redevelopment. This is confirmed by the electoral role of 1958. On 12th January 1960 Beatrice Susannah Trayhurn then described Beatrice lived as a widow of 16 Chapel Street sold the property to Thornbury Rural District Council. Beatrice died on 6th May 1960. Their daughter Norah Ellen Green the wife of Arthur Allen Green died 10th July 1964 aged 50. Thomas died at 60 St Bride’s Road Aberkenfig Glamorgan on 14th September 1966. John Trayhurn. John was a tailor who lived in the house from around 1859. He was born about 1795, the son of John Trayhurn and his wife, Ann. The 1859 rate book suggests that by this time they had moved to a house owned by ‘Mrs Parnell’ which was to become 16 Chapel Street. The 1861 census confirms that John Trayhurn lived there. John Trayhurn was still living at what is now 16 Chapel Street. By this time he was 76 and still working as a tailor. Hester was said to be aged 72. Hester died aged 73 and was buried on 28th January 1872. John died aged 83 and was buried on 18th April 1874. Click here to read more about John Trayhurn. Henry Holpin. The 1891 census shows that the house was now occupied by Henry Holpin (or Harry as he was known) aged 31 who was an agricultural labourer. He was living with his wife Sarah who was born in Alveston and then aged 39. They had four children Elizabeth aged seven a scholar, Henry aged five, Ellen aged three and Emily aged one. Harry also had a stepson called Thomas Godwin aged 16 who was a tiler and plasterer’s labourer. We believe Henry was born about 1860, the son of William Holpin and his wife, Elizabeth who were living in Grovesend. William was an agricultural labourer. The 1881 census shows that Henry had left home and was boarding at 27 Page Street, Swindon. He was described as a general labourer. We believe that Henry Holphin (sic) married Sarah Godwin in the Barton Regis district in 1882. In the census of 1871 Sarah Godwin had been married to George Godwin an agricultural labourer from Oldbury. They lived in Alveston with their young son Henry aged three months. We believe that George died in 1878 aged only 27 and was buried in Thornbury. By the 1881 census Sarah was a widow and a servant in the household of a butcher called James Wise in Park Place in Clifton. We have found that the 1887 rate book shows a Henry ‘Olpin’ at what became 15 Rock Street, but by the 1891 they had moved to 16 Chapel Street. The rate book of 1894 confirms that that house was occupied by Henry Holpin and owned by George Walker. Henry and Sarah had two more children born in Thornbury before the moved away. Sarah Ann was baptised on 9th September 1891 and Sarah on 3rd September 1893. The 1901 census shows that the Holpins had moved to Barry in Glamorgan. Henry was still working as a general labourer and their son, Harry, had become a mason’s labourer. Their daughters, Ellen, Emily, Sarah Ann and Sarah, were all living with them at 17 Club Road, Barry. The 1901 census shows that Harry was a dock labourer working on Barry Docks and Railway Company. Living with Henry and Sarah at 19 Plymouth road were their son, Harry, a greengrocer, daughter, Sarah who was assisting at home and Sarah’s father, Thomas Cotterell. Thomas was described as a farm labourer and old age pensioner aged 87 and born in Thornbury. Henry’s death was registered in the Chepstow area in 1933 aged 73. Sarah’s death was registered there in 1938 aged 85. Sarah Collings. The 1905 rate book shows us that Sarah Collins or Collings was the next tenant of Thomas Exell in this property. The 1901 census confirms that she must have moved into the house after Elizabeth Prewett. Sarah had moved here from Hackett Lane. She was aged 48 and a baker. Her son James aged 20 was a quarryman and daughter Mary aged 18 was described as “mother’s help”. Mary was needed not only to help with the bakery but to look after Eva aged 11, Clara aged 7 and “Siscelia” aged 6. Sarah Collings nee Burford was the wife of a haulier James Collings. The couple married in Thornbury on 14th April 1873. Their son James was baptised in 1881 when the family lived at Morton. In the 1901 census James Collings Sarah’s husband was living at 6 Rock Street. The 1911 census shows that Sarah moved to Crossways. Aged 58 at this time she said she had been married for 38 years. She had had 12 children of whom ten survived. She was earning her living as a charwoman and looking after two grandchildren Celia aged 16 and a dressmaker and Ruth aged nine who was still at school. We do not know who these children were, presumably “Siscelia” and “Celia” were the same child even though the former was previously said to be a daughter. They had a young boarder George Ford a farm labourer aged 16 living with them. It seems that Sarah Collings or Collins, despite her hard life, died in 1933 aged 80. Richard Sims was the grandson of William and Eleanor Sims (see above). He and his wife Edith gave Chapel Street as their address in the electoral roll of 1946 but by 1950 their address was the Bungalow in Castle Street. Richard Thorn Sims married Edith Mabel Pearce the daughter of Thomas and Sarah Pearce who lived at 46 Castle Street. The photograph above was taken at the time of the marriage of Richard and Edith Mabel. 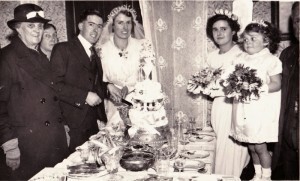 It shows Richard’s grandmother Eleanor on the left of the photograph. Richard’s sister Elizabeth is the older bridesmaid next to the bride. The register compiled in 1939 in the advent of war shows that after their marriage Richard and Edith lived with her parents at 46 Castle Street. Richard was a provision hand in a grocer’s shop. In 1947 the property was advertised for sale “for many years in the occupation of Mrs Sims.” The catalogue said “Lot 5 the semi detached stone built corner house situate at Chapel Street with frontage also to Upper Bath Road let to Mrs Sims at an inclusive rental of 5s 7d per week. The accommodation comprises small entrance hall two front sitting rooms kitchen with Nelson grate, pantry and four bedrooms also lean-to wash house at rear with sink and boiler and lean-to coal shed all main services good garden with side entrance. Lot 6 a valuable stone built large shed and stabling with loft situate at Upper Bath Road adjoining lot 5 and let to Mr Salisbury at a rental of £1 12s 6d per quarter. ” Eleanor Sims died in 1951. The tenant of the stable and shed was William Hiron Salisbury a butcher who lived at 53 St Mary Street. Beatrice and Thomas Trayhurn (as he appears to have been called) lived in 16 Chapel Street from about 1955 until Beatrice sold the property to the Council for redevelopment.